I’m still very conflicted if I should do this post. I definitely don’t want it to come off as a show off post. But I just have a lot to say about the topic. 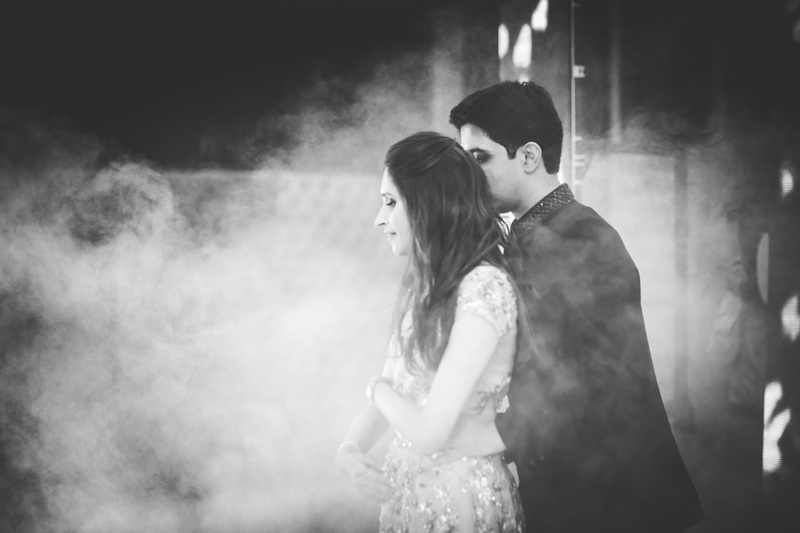 And while the Indian Wedding genre of blogging is saturated, there isn’t too much written about my city, Pune. So this is a mix of showing you what my wedding was like, I’ve kept few photos because I’m private that way but scroll down to find a ton of vendor information and my more about wedding planning. To recap, my then-boyfriend proposed in April and I got married in December 2016! So it’s been roughly six months since and I’ve had a lot of time to reflect on everything. 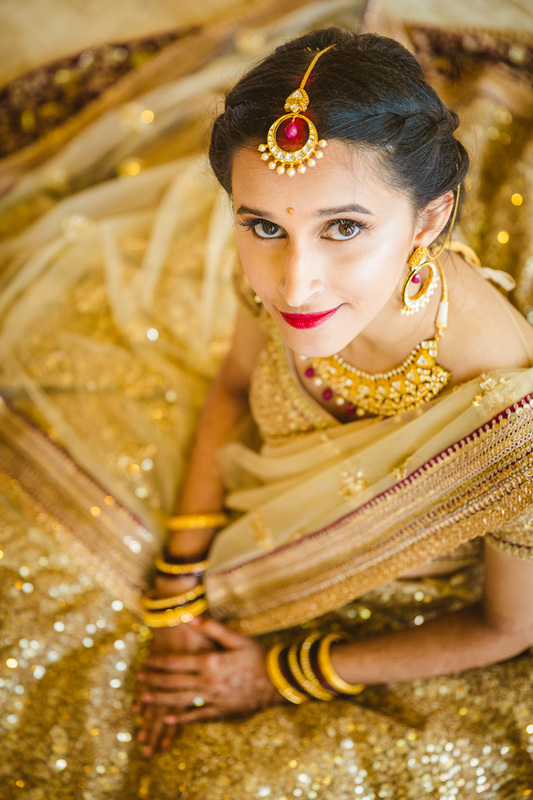 If you’re having a typical or “big-fat” Indian or South-East Asian wedding, you’re not planning for just one day of your life, it’s the entire week of making sure everything is perfect, overseeing logistics and trending carefully over egos of everyone involved (and also those not involved). At the end of this experience, I’ve had two profound thoughts. One, I don’t want to plan a wedding by myself again and two, I deserve an honorary MBA of some sort. Ok, maybe I’m being too snarky but looking back I do kind of miss the frenzy and that feeling of looking forward to something. Definitely not missing the anxiety though. 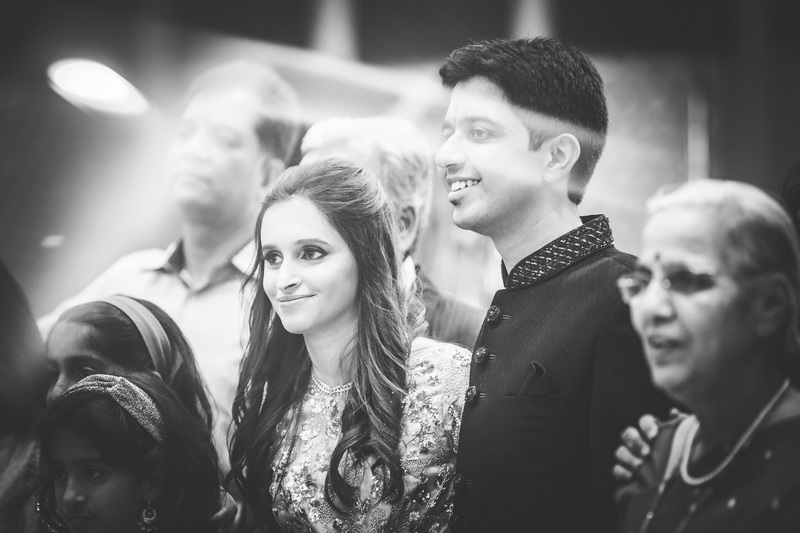 So here’s what the wedding week looked like. 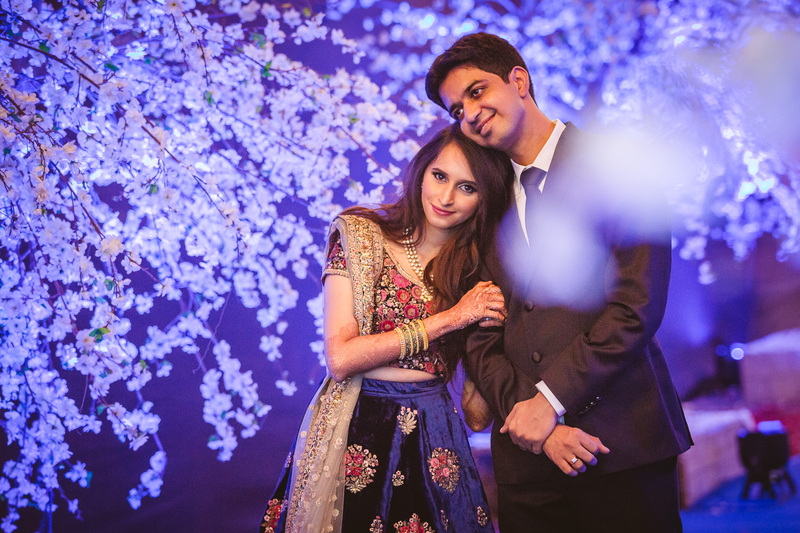 Day 3 Evening – Engagement and Sangeet! 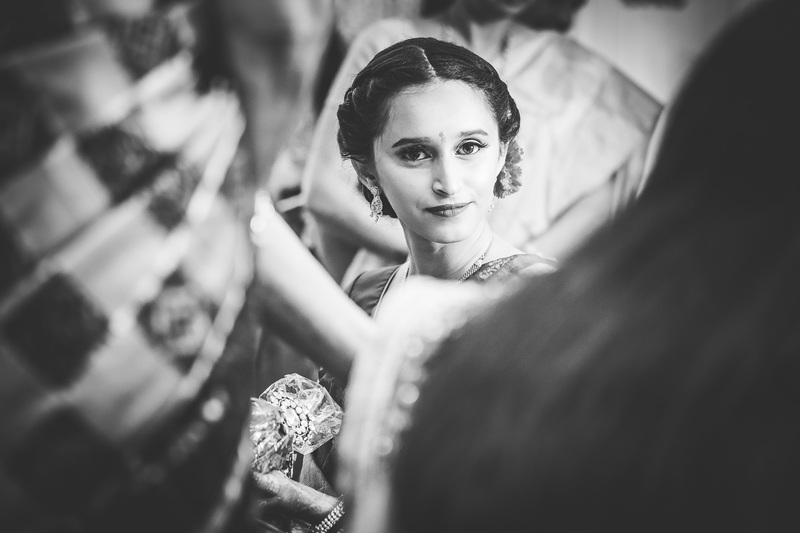 Day 4 Morning – The Wedding! Day 5 Evening – Reception! 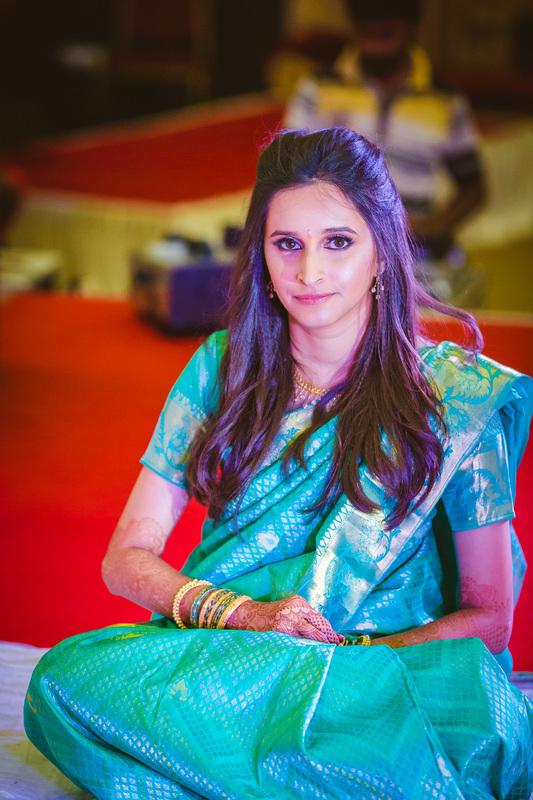 For my engagement, which was a rather short one hour affair, I wore this gorgeous aqua blue Kanjivaram saree. This is my favourite one out of all the ones I bought for various functions. I love the light summery colour the actual motifs running throughout the saree are in three different shades, it’s so unique! This is also the very first saree I purchased. I was in Kochi with my family and we just decided to visit a shop to look at different sarees to judge what’s out there. I instantly fell in love with this one! 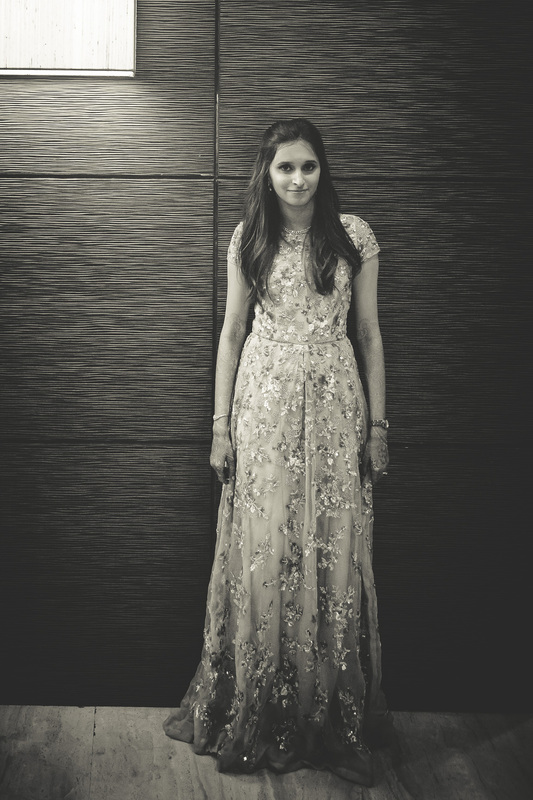 After the rings were exchanged, I then wore my second outfit, a light grey gown by Natasha Dalal. It’s very light and the sequin/pearl work is very fine and tidy. I visited her studio in Mumbai a couple of times, had a fitting once and it was couriered to my house. 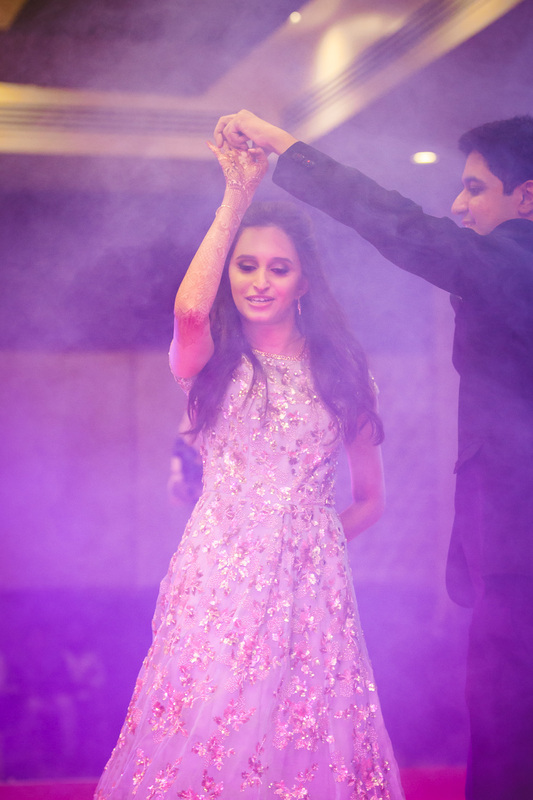 The sangeet was actually the best part of the wedding even though I had my reservations initially about keeping one. Everyone was on their feet dancing the night away. We had so many performances from friends and relatives, it was brilliant! I promise this wasn’t at a rave, but look at that highlight! The evening was very tiring, I reached home at midnight and had to wake early at 5 to get started on my wedding makeup and draping. 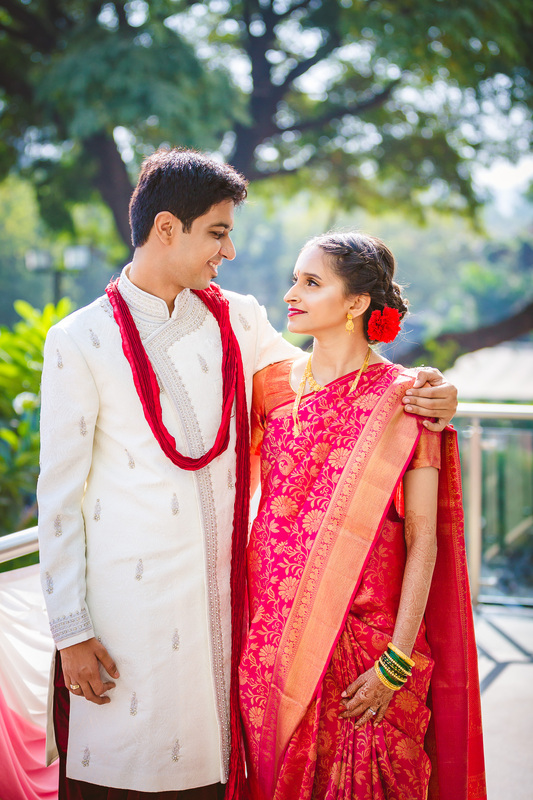 The wedding was a mashup of Maharashtrian and Gujarati customs and I had to change my attire twice. 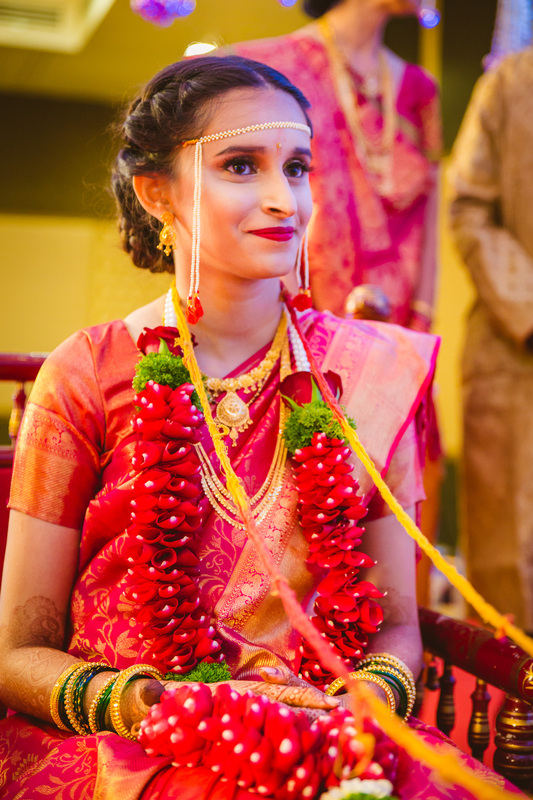 First up were the pre wedding ceremonies where I wore this bright red saree from Pothys Boutique, I love the detailed motif here as well. For the main wedding ceremony, I had to change the saree again (my room looked liked it was turned upside down at this point). 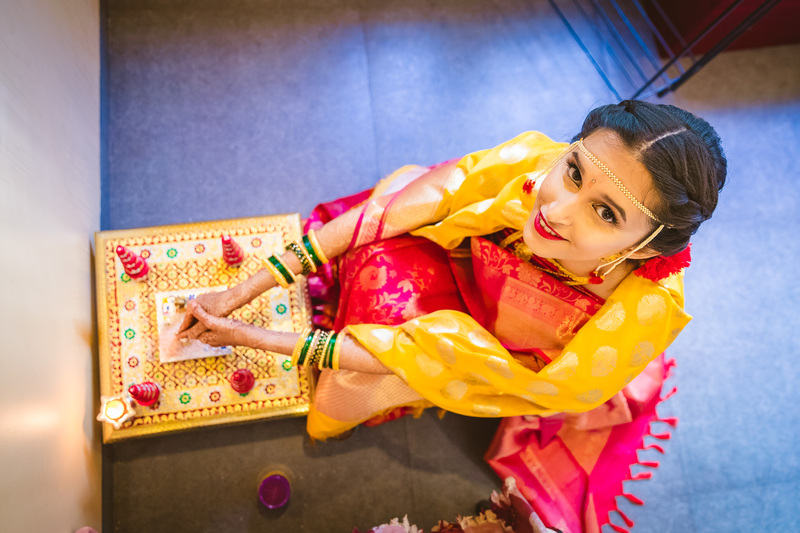 My bridal saree what bright pink with gold all over (also from Pothys). I initially thought it was maybe too bright but now after looking at all the photos, it definitely seems alright! Better to be overdressed than underdressed in this case! 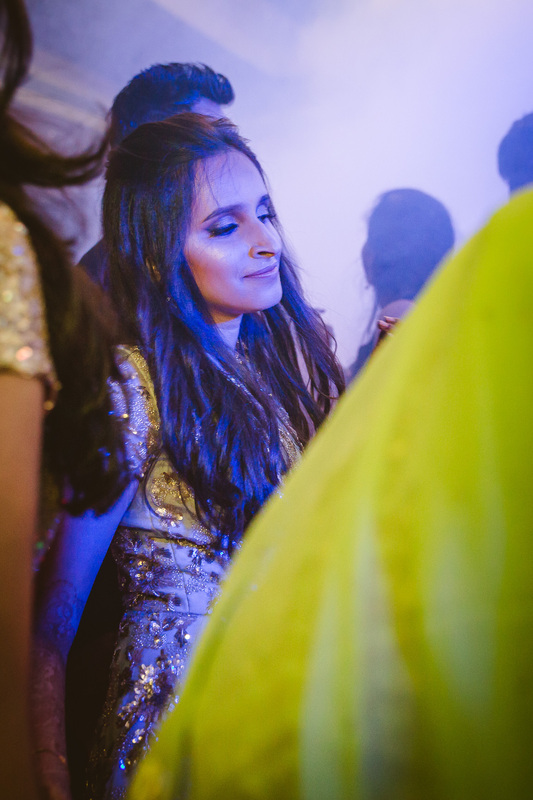 After the wedding, I changed into a lehenga. Right from the beginning, I knew I wanted a gold lehenga and when I walked into Sabyasachi the first time, this was out on display and it looked perfect. 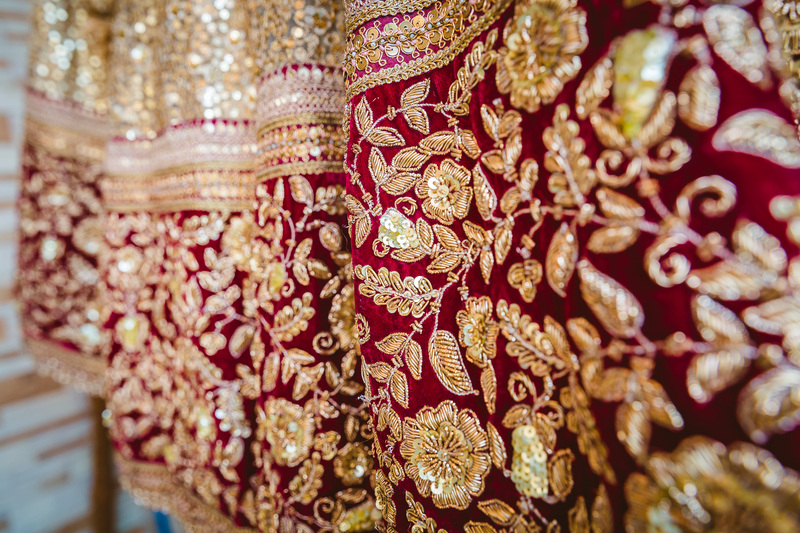 The gold sequin reflects in almost a flowery pattern and there is that bit of maroon that keeps it from being too plain. I also added red tourmaline to my jewellry so it would pop really well against the gold. This one was quite heavy though, I survived more than 5-6 hours in this! The next day I was able a catch up on some sleep and we had another pooja at the house where the pandit was 3 hours late! That threw our schedule out of whack and I managed to reached the reception venue just half an hour late. The good thing about the reception is, you just have to be on stage and greet people, there isn’t much you are required to do. Your family on the other hand has to run around and make sure they’ve met everyone which is more tiresome for them. Towards the end, our friends all came up on stage and we did another Mannequin Challenge, it was fun! My lehenga for the reception was also from Sabyasachi. 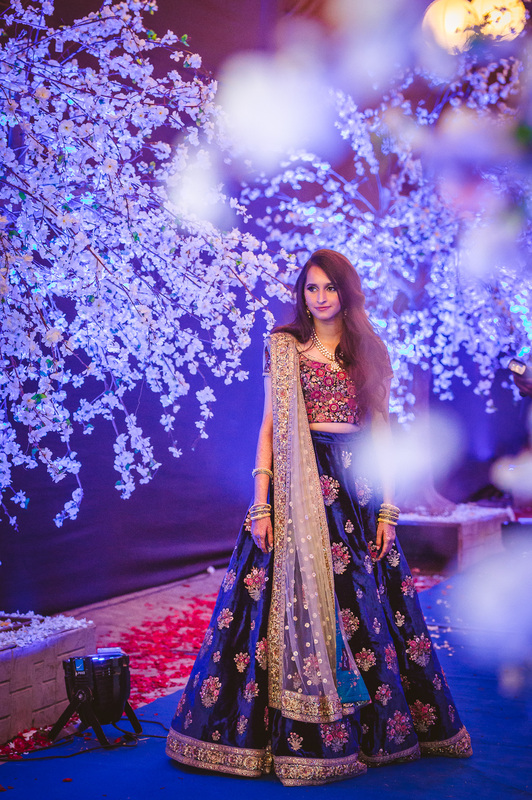 I always had the colour blue in mind and it’s not the most popular colour then it comes to bridal lehengas. This was from his collection last year and it blew my mind when I first saw it. It’s velvet which looks really rich, the embroidery on it is so intricate and pretty, it’s also deceptively light, I would run in it! It was actually the blouse I fell in love with first, I love the bits of pink and gold in it. I felt like this was very different from my previous outfits and still suited my frame. 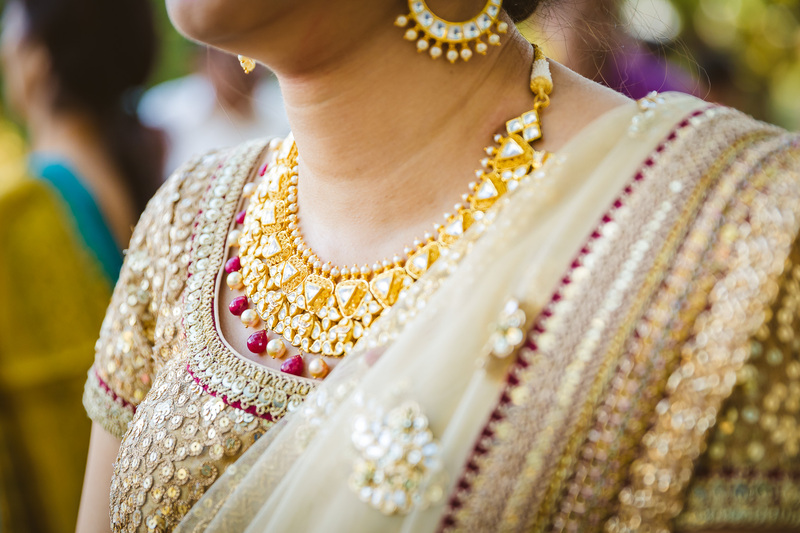 As the blouse and lehenga were more busy, I kept my jewellery very simple this time round. When I first started out with the prospect of getting married, I wanted a small wedding, maybe even just a registered wedding. Naturally, both sets of parents were appalled and they made their case. I was convinced in the end because a lot of what they said made sense. Friends and relatives flew from all over the world to be here, to spend time with us and be part of the wedding, we need to show them a good time. Both families get enough time to meet and get to know each other who wouldn’t meet otherwise. It’s basically a reunion for the family and friends, which turned out to be very true. In hindsight I’m glad I listened to them. At the end of the day, we want blessings and good wishes from our loved ones, a small ceremony when the family is very large would have felt very exclusionary. I’m not saying this is how it should be, I don’t want it to be read the wrong way, just that this was what made sense the most to us. 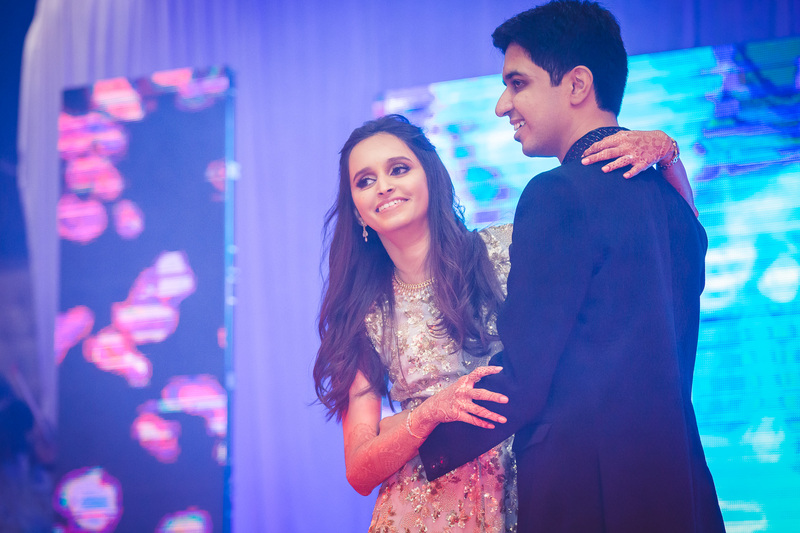 We decided to keep a Sangeet because everyone in the family was very enthusiastic about it and performing dances. My SIL was a rock and orchestrated the entire event, would not have been such a success without her. We also decide to keep the wedding and reception two separate events because the alternative was inviting 2000 guests on one day. Also, since the wedding was in the morning and the reception in the evening, people could attend depending on their convenience. Those who had office could come for the reception. 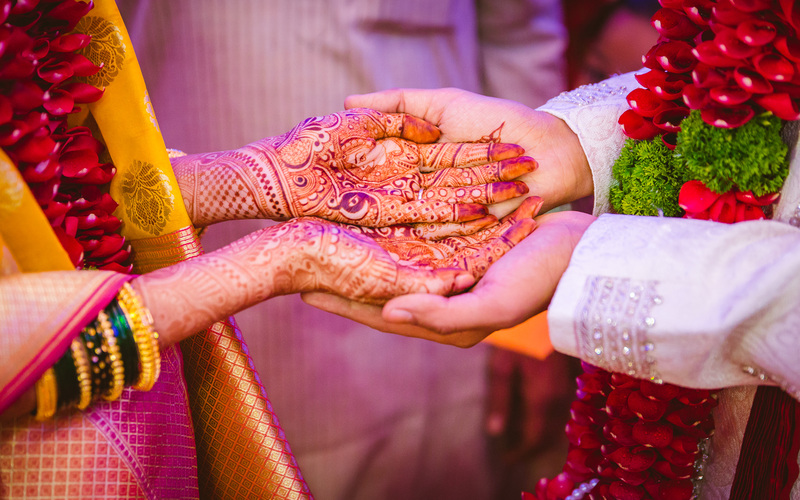 A lot of people were coming from Bombay and they could attend the wedding in the morning and head back the same day. I would say start early and get those address books out and get an estimate of number of people that will attend as soon as you can. Get that number right is helpful for getting quotations for a lot of things. We were spot on on most days. For the reception we were expecting around 800-900 people but the actual count was close to 1100! Thankfully, the caterers managed it really well and the venue also never felt too crowded. Turns out every single person from my FIL’s undergraduate class and first place of work came to the wedding as did all of my father’s classmates. 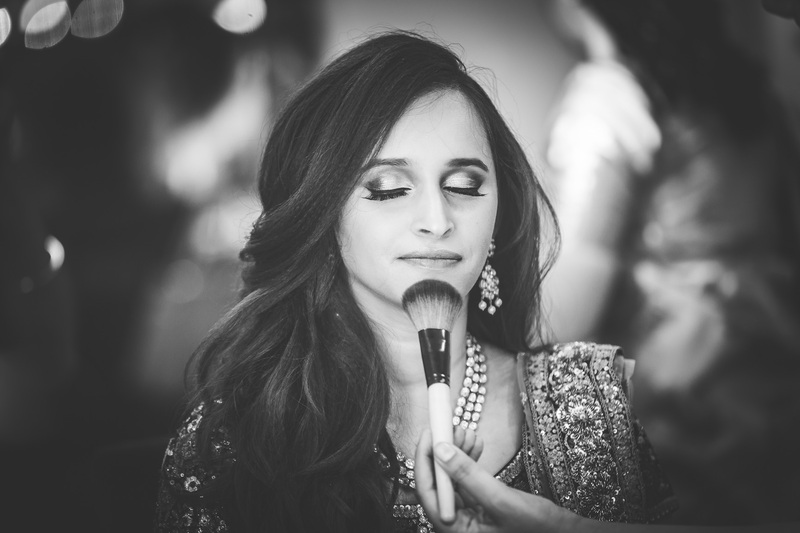 Do your venues, photographer, caterer and makeup artist bookings early and get it out of the way. Then you can focus on your clothing, jewellery and decor. 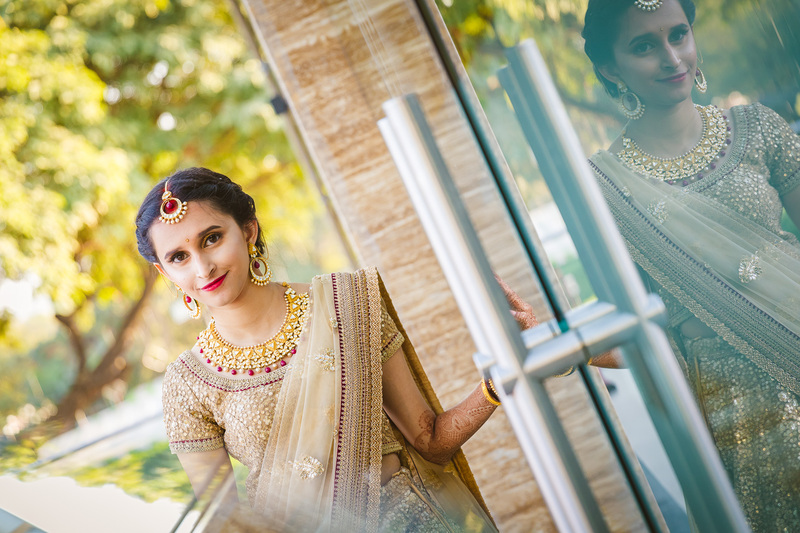 I know people say do your jewellery first and then your lehengas but I did the opposite because I really wanted everything to go well together. One month before the wedding, I had everything in place. Also when vendors ask for the wedding date, give them a date 3 weeks in advance if you’re a control freak like me. I feel like I’m missing on a lot of things so shoot me a mail or ask in the comments if you want to know anything specific. Jogeshwari (on Kumthekar Road, Pune) – My mom and I bought a lot of sarees from here. Their collection is so vast the customer service is top notch. 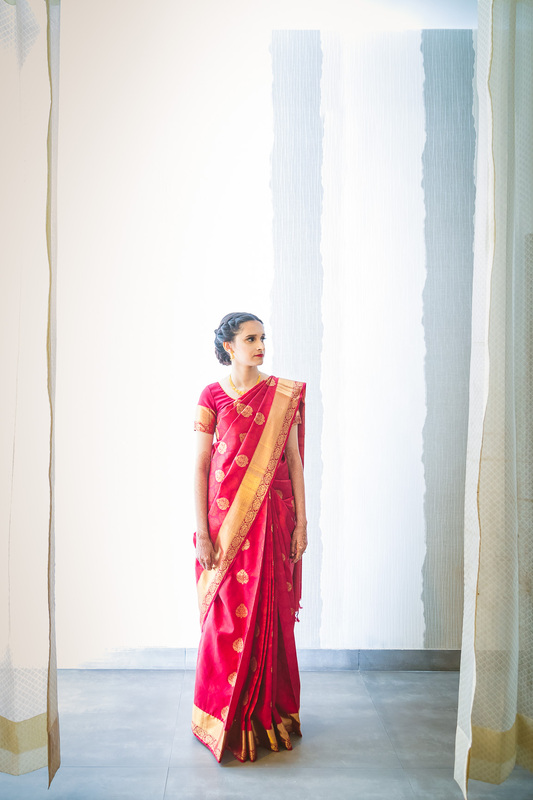 We must have seen over a 100 sarees and walked out with just one the first time we visited. When we came back, he still treated us like we were their best customers. My mom bought her Reception saree from here and a couple of more for other functions as well. 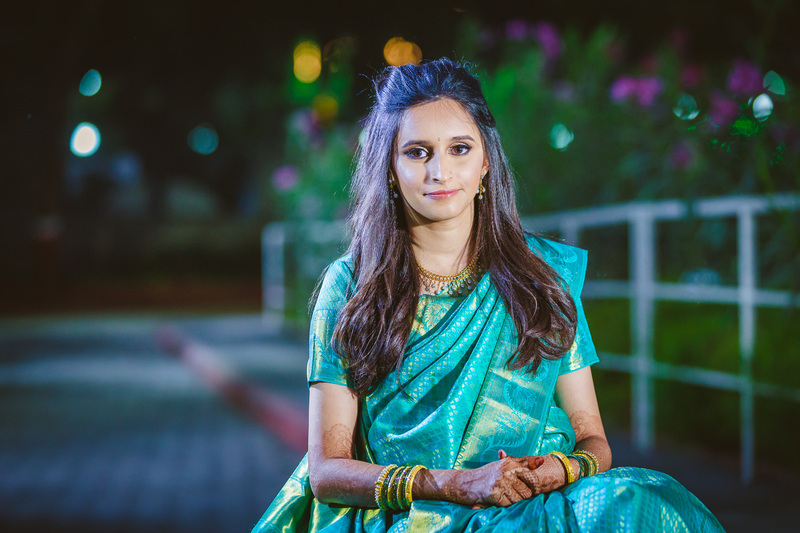 Fursungi – My MIL had a lot of gift sarees to buy as their family is ginormous, she bought them all from here. This is a town on the outskirts of Pune where everything from a toothpick to a bridal saree is sold on wholesale prices. So if you have a ton of gift sarees and shirts to buy, it’s worth paying a visit. 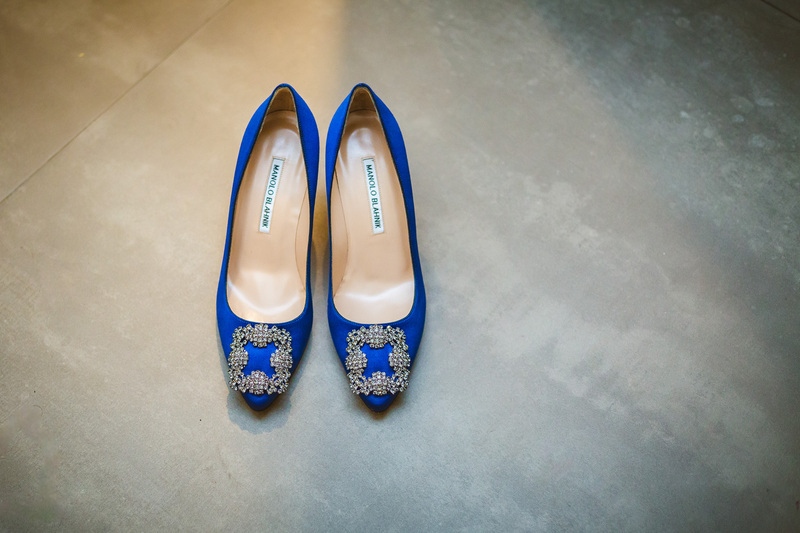 WedMeGood – I vetted practically every vendor here and there is so much inspiration on the blog. I must have spent days looking at photos here. 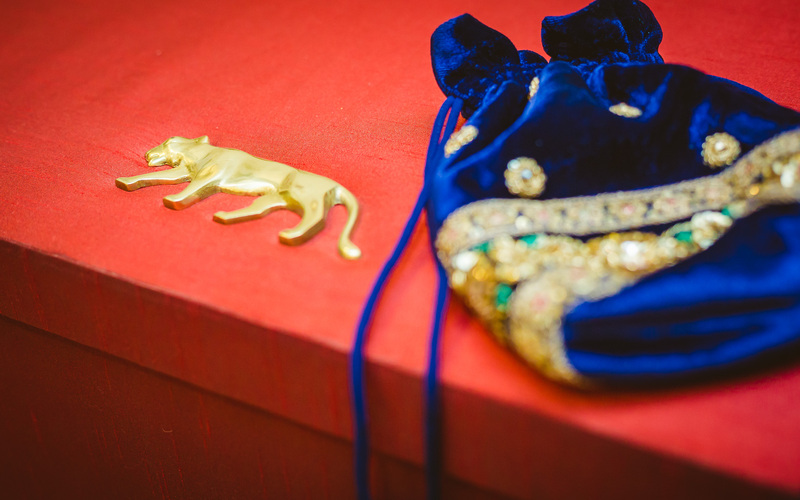 My favourite moments shopping were definitely at Sabyasachi, the store itself transports you to a different world. I visited the store twice before I booked my lehengas, a third time for my fitting and then finally while collecting it. Each visit is memorable. I found the SAs here very welcoming, not something other designer stores learn from. My SA was Nancy if you’re looking for a recommendation. 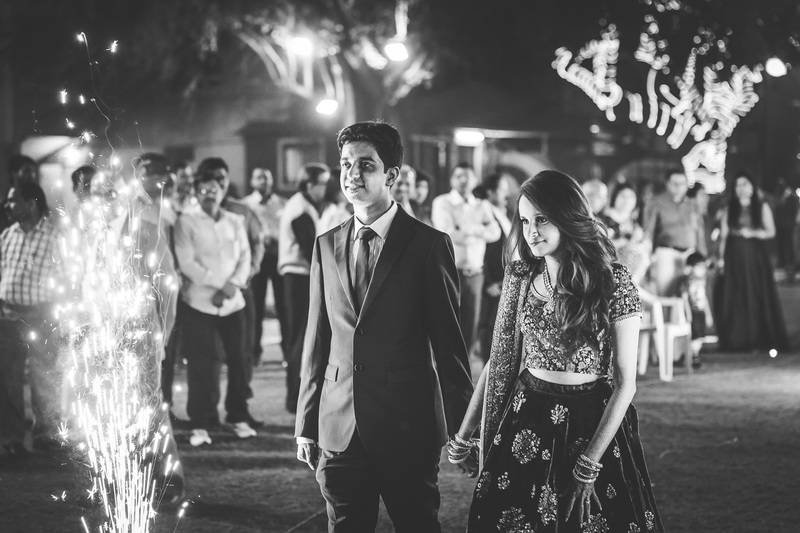 She completely understood my aesthetic and what suited me, didn’t push me towards the heavier lehengas. I also briefly met Sabyasachi himself, which was amazing and he “approved” of my choices. 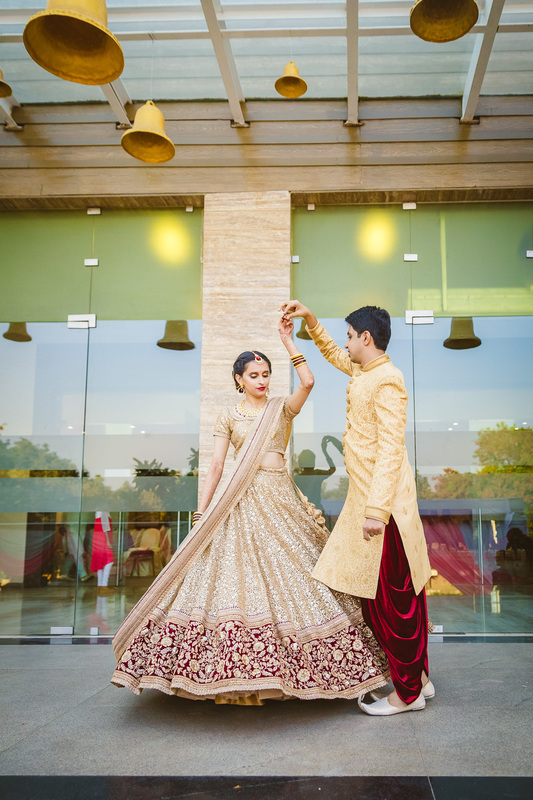 If you’re lehenga shopping in Bombay some of the other stores worth visiting are Shymal & Bhumika (Peddar Road), Anita Dongre (Linking Road), Aza (Bandra), Dolly J (Bandra), Manish Malhotra (Bandra). Also, Aza for groomswear is only available at the Bandra store. For jewellery shopping in Pune, I recommend the following. Take a bottle of water, snacks and spend the day trekking the entirety of Laxmi Road. For gold, I suggest PNG. For Kundan and Polki, Rathod have the best and most extensive collection. TBZ also has a store in Pune but the collection is limited. For diamond, I personally like Tanishq. I actually wanted to buy a set from them but it was sold out, I got something similar made from Lagu Bandhu instead (which is great for simple traditional jewellery and diamond rings – they use the highest quality diamonds). I hope all of you are having a great summer! I got a lot of amazing comments on my last post, thank you so much, it really makes my day when I hear from you guys either here or on Instagram. I’m working on my Notes on Glossier post already! I’ve promised myself to put it up this month. See you all soon!